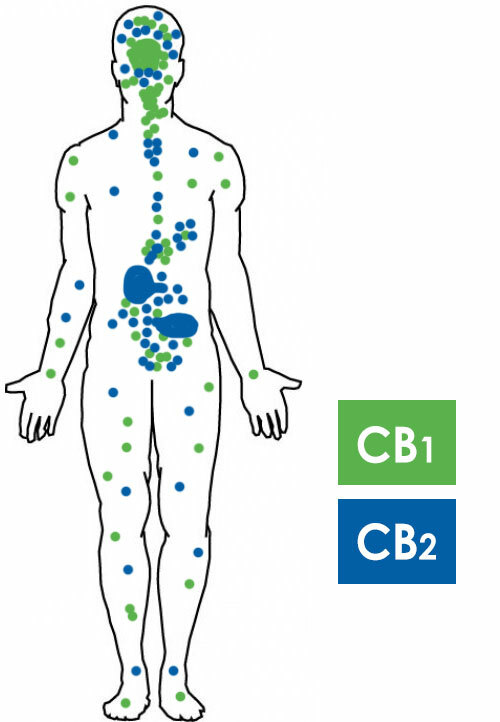 The endocannabinoid system (an abbreviation for ‘Endogenous – i.e. within the body – Cannabinoid System’) or ECS, refers to the internal chemical processes which mediate homeostasis (maintenance of a stable balance) within the body. The endogenous cannabinoid substances are lipid (fat-soluble) messengers which communicate between various cells in the body, adjusting for various internal and external environmental changes. Their action affects such physiological processes as appetite, pain-sensation, mood, and memory. So far, two cannabinoid receptors have been identified in the human body, respectively called cannabinoid receptor 1 (CB1) and cannabinoid receptor 2 (CB2). The CB1 receptor is mainly found in the central nervous system (CNS), whereas the CB2 receptor is highly expressed in cells of the immune system. The discovery that the human body contains an endocannabinoid system and subsequently produces chemical compounds similar in nature to the elements found in Cannabis has been a key factor in the advance in medical research regarding medicinal cannabis use. The cannabinoids present in cannabis can affect the ECS by either a process of agonism (stimulation) or antagonism (restriction) of cellular uptake of endocannabinoids, thus altering the body’s processes in these regards. Even though the anti-inflammatory effects of cannabinoids have been demonstrated in several preclinical studies, serious research activity in this area has been relatively limited. This may be attributed – in part – to psychotropic side effects and poor bioavailability of orally administered cannabinoids. Clinical evidence supporting the introduction of Δ9-THC or other cannabinoid receptor agonists, for example for the management of disorders such as glaucoma and cancer, and for the relief of postoperative pain, spasms and spasticity caused by multiple sclerosis and painful spasticity triggered by spinal cord injury also has been obtained. You will find the source of this information here. Sensi Pharma is dedicated to developing the highest quality medicinal cannabis as well as providing cannabis consultancy services to both medicinal and governmental institutions. All our products are produced under stringent conditions, ensuring reliable and consistent results. Copyright 2019 Sensi Pharma. All Rights Reserved.